NYC Educator: The Eternal Question--To Go or Not to Go? 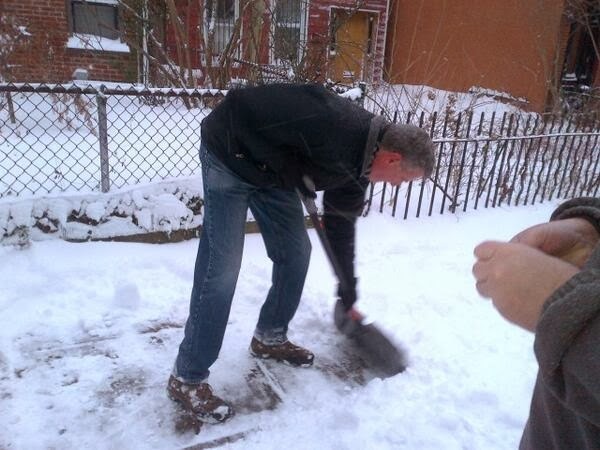 Update: Very cool to see Mayor Bill de Blasio actually shoveling snow in front of his Brooklyn home on CBS 2. Doubtless it's for show, and he says he's going to share with Dante, but it's impressive. Can you imagine Emperor Bloomberg doing that? Neither can I. The only show we got from Mayor Money was the pretense of going to the subway. Actually, two SUVs came to his brownstone each AM to drive him, since his preferred subway stop was too far for him to walk. Update 4:47 AM: NYC SCHOOLS ARE CLOSED. Mayor de Blasio made a good call. Perhaps he simply waited so as to look a little tougher to his manifold corporate critics. But he did the right thing. You don't send a million kids out in weather like this, even though it was no problem for a guy like Rudy Giuliani, and even though it took Mike Bloomberg until maybe 6:30 AM a few years back. Also, unless they're using some very sophisticated new technology, it appears Bill de Blasio is in NYC rather than Bermuda. LIE will remain closed until at least 8 AM, so in case you feel like going in anyway, don't. Update: As of 4:12 AM CBS TV says they don't expect a decision from the mayor until around 5 AM. They also say that plowing the streets has been useless, as the wind blows the snow instantly back. Wind chill 10-15 below zero and LIE is still closed. Crews still trying to determine whether or not it's safe to open. If they don't open the LIE, it will be incredible to see schools open. As a New York City schoolteacher, I've got a lot of memories about snow days. Right now I'm remembering a day I drove 10 miles from my house, only to hear on the news that city schools were closed. Another time I went in on the treacherous Long Island Expressway, with cars crashing to my left and right, and heard my then-boss, Rudy Giuliani, on the radio saying it's awful out there. If you don't absolutely have to, don't come in. I don't remember the exact quote, but I did that morning. I posted it on the board and discussed it with the handful of students who'd bothered to show up. My fondest memory was the bet I made with my mom a few years ago. She said the schools would close. I said no, they open no matter what. She bet me ten bucks they would close. I took the bet and lost. When they closed a second day, my mom demanded twenty. I refused to pay the second day. Sometimes you simply have to stand by your principles. This post will go up at 4 AM. With luck, I'll still be asleep. The question is, are we going in or not? Is Carmen Farina going to open her term with a snow day? Will Mayor Bill go for it? And if he doesn't, are you going in anyway? I usually do, but I'm crazy so you can't go by me.